January is GO Month! | Enuff with the Stuff – Sort Stow and Let It Go! 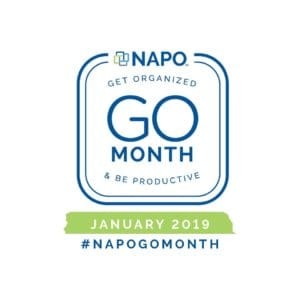 January is Get Organized & Be Productive (GO) Month and the National Association for Productivity and Organizing Professionals( NAPO) has created GO month for January because it is when most people get inspired to start fresh and one of the activities many people choose to do is to get organized for the new year. I wanted to help people get started with their desire to get organized by posting weekly on FB, small organizing projects that will take no more than 15-20 minutes to complete. If you would like to participate you can head over to my FB page, at https://www.facebook.com/enuffwiththestuff/ and follow along to find out each new project. My hope is that after completing these small areas while practicing my 3P’s method, you will be ready to handle bigger challenges such as a bedroom closet or spare room which became a store-all for things you didn’t know what to do with, or even a garage. My Three P’s method of organizing is meant to simplify the process of how to go about organizing any space. P– Pair like items, or items with like purpose/category, together so that you can see how much of a particular category you actually have. Ex. pair all of your long sleeve shirts together by color and you may discover you have ten black long sleeve shirts! You just may have never realized you had so many because they weren’t stored together! P- Purge what you no longer love, need, or serves a purpose. If the items are broken or damaged in any way but you have been holding on to it to have it repaired, ask yourself how long have you already been saving it and still haven’t bothered to get it fixed? Let it go. Stop wasting your energy thinking about that task every time you come across the object, just recycle it or of it responsibly. P– Place what is left after purging. Now that you know how much you have of whatever you chose to organize, you can place the items in a home that makes sense for where the items are used and how often you need access to the items. Keeping the example of organizing your closet, if you have a closet that is simply inadequate, even after purging, then you should store out of season clothing in a spare bedroom closet or in plastic bins in your storage room. Now your closet will be easier to use because only the current season’s worth of clothes is taking up space in your closet. Another example would be if you have lots of files in your office that you don’t need to access regularly. Those files should not be taking up prime real estate in your most frequently used file drawer or cabinet. Archive the old files in an out of place location.